In place of colonialism, today we have neo colonialism as the main instrument of imperialism. It refers to the use of economic, political, cultural, or other pressures to control or influence other countries, especially former dependencies. 1) It leads to a situation of dependency of the host country onto the foreign countries. This dependency is encouraged by the foreign power in order to continue the subjugation. In the words of AG Frank it creates a situation of “development of underdevelopment” which means that while the situation in the colonies deteriorates, the foreign country benefits out of it. 2) The foreign country experiences asymmetric benefits through its use of capital, the control of MNCs. Often this influence spills over to the political domain as well as seen in many Latin American countries where MNCs effected toppling of the domestic regime to serve their economic and commercial interests. 3) The result of neo-colonialism is that foreign capital is used for the exploitation rather than for the development of the less developed parts of the world. Investment under neo-colonialism increases rather than decreases the gap between the rich and the poor countries of the world. The struggle against neo-colonialism is not aimed at excluding the capital of the developed world from operating in less developed countries. It is aimed at preventing the financial power of the developed countries being used in such a way as to impoverish the less developed. 4) The economic dependency is also utilized to gain other benefits such as positioning of military by foreign power, gaining control over the civil administration in the country. Neo-colonialism is based upon the principle of breaking up former large united colonial territories into a number of small nonviable States which are incapable of independent development and must rely upon the former imperial power for defense and even internal security. Their economic and financial systems are linked, as in colonial days, with those of the former colonial ruler. However use of foreign capital in today’s era of globalization has also led to benefits for countries like India who have built enough safeguards in their political and economic system to ensure that foreign countries are able to exact limited control on domestic policies. Countries which have a well established polity, sound economic management, are able to tide over the ill effects of neo colonialism. 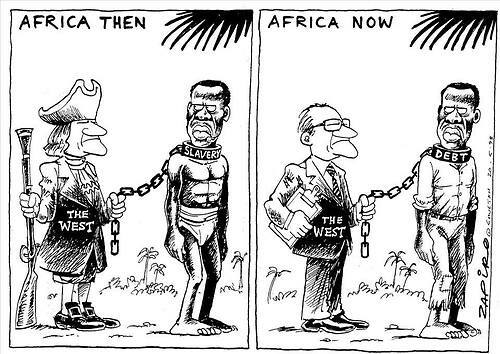 That being said, it is important to realize the ways in which neo colonialism operates. In an era of gloablaization, we have seen wealthier countries prosper at the cost of their “dependencies” leading to inequality greater than ever before. The aids of IMF, for instance, comes with certain aid conditionalities which affect the developments in colonies. It is for this reason that India had proposed a New International Economic Order at the United Nations to tide over the ill effects of neo colonialism.